‘Hercules’ is a no-frills knotwork design with lots of straight lines and easily-defined loops of cord. I like using it for rainbows and color gradients. I find it just challenging enough to keep me from losing focus, without distracting me from audiobooks or podcasts. 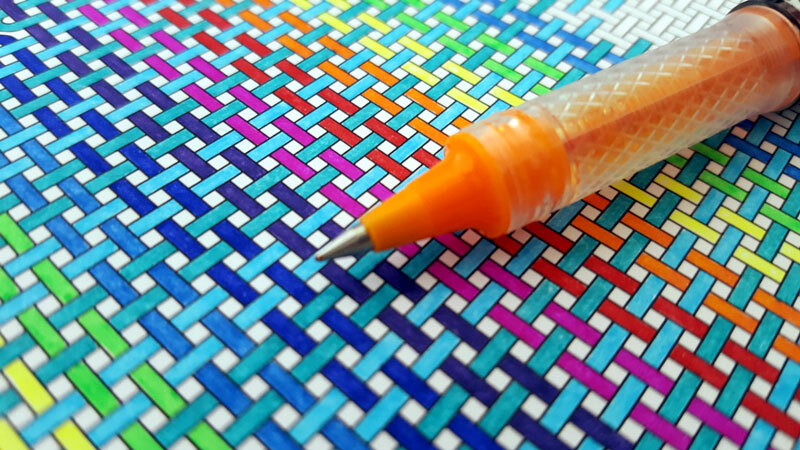 Colorers who find repetitive tasks soothing will particularly enjoy this page. The simple nature of the design makes it ideal for printing multiple times to try different color schemes. My knotwork coloring pages are intricate, tiny, and very advanced! That makes them unsuitable for colorers with poor fine motor control or any disabilities of the hand that could cause pain. I don’t want anyone to hurt themselves trying to color these pages in! Take plenty of breaks, stretch your hands, and be careful of your posture.